These are words of Babaji and is typed here in direct speech. For the new reader's sake, I have added in brackets or italics. If you are not tripth (satisfied) in grihasth, then in vanaprasth you will remain atripth (unsatisfied). While the husband is meditating, he should be the greatest sadhu and while he is with his wife, he should be the greatest lover. Any disease said to be "incurable" is a lie! Every six months a new organ is formed. If you heal the manomaya kosha then you will have excellent results on the physical body. Don't attack the physical body. ShivYog says to start from the manomaya kosha. Burn karmas at the manomaya kosha (mind) that is creating problems on the annamaya kosha (body). When the sanchit that is ready to become prarabh is burnt, there is a vacuum created and that is SAT CHIT ANAND (turiya avastha). Learn to acknowledge the chakras and body organs. Sushumna nadi is the storehouse of your consiousness. Kundalini is the female energy that moves from mooladhara upwards in the sushumna nadi and goes to the sahasrar (pineal gland - seat of GOD). With chakra siddhi comes levitation, teleporation, etc. Ida (surya) nadi is sheetal (cool) and pingala (chandra) is garm (warm) and sushumna nadi is neither warm nor cool. Every chakra has its own energy and its own soul. The chakra can be impure but not its soul. In chakra healing it takes days and months to clean but the moment the soul is awakened it will rise and shine and the impurities (negative energy) will disappear. Anbe Shivum means the grace of Shiva (in Tamil). Never feel helpless. Never feel finite (with limitations). Whenever there is any problem, remember Him. Connect. Merge your rhythm with Shiva's rhythm and merge "tum chahthe kya ho" with it and you will see everything change. Whenever I ask "tum chahthe kya ho?" don't feel at the physical level but through your soul. Now with Shambhavi, your materializing power has been multiplied by thousands of time. Wherever or whatever you think of, Sanjeevani will reach there. Think of your family and children and it will provide them with divine energy needed for their growth and protection. Relish every moment of your life. Jahan teen peediyon ka vaas ek chath ke neeche hothi hai waha Shiv ka pravaas hota hai. (Wherever 3 generations live under one roof, there abides Shiva). Why do you go for vacation? To unwind and experience happiness. You are on planet earth for vacation. Keep visualizing your Golden Book and merge (in turiya avastha). One day will come when you will be in turiya avastha. Everything has a rhythm and you should merge with that rhythm to be one with it. 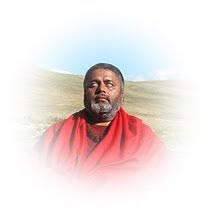 After your chetana (consciousness) rises you will be able to experience fast and change the rhythm. Any situation, get into the rhythm of that situation's consciousness. Here in cities, you will not be aware of it because you are intellectuals but the same awareness can be sensed easily at Mount Kailash. Atomic configuration is created by bhaav. I was told by my guru only to tell others what you can make them experience and not what you (Babaji) can do. Telling what you (Babaji) can do means telling about magic. Create maya in this world if you want but do not get stuck with it. Be like the lotus (untouched by filth). With animals and plants merge with their consciousness and you will become one with them. Unification (merging) with any situation, being or thing creates harmony with it. In the root of rhythm is hidden unconditional love. With Sanjeevani, you cannot do anything negative. There will be an immediate disconnection and the power will go away. This is a life-giving not a life destructive method. Hanuman was called vaayu putra; He had merged with the vaayu tatva. We have limited ourselves to the prisonof limitations of modern science - we have that infinite power. Silence is the language of truth. Attune to not the silence but the language of silence, that is the rhythm of silence. We know and believe that when there is cut, burn, or fracture it can heal naturally but we don't believe an internal organ can heal because we have transferred in our consciousness somewhere that an organ cannot heal because it is hereditary, etc, etc, etc. A true disciple will be silent with his guru and not verbal. The disciple will take in his guru's consciousness. Sanjeevani sadhana + surya sadhana = Mritsanjeevani sadhana. The sun has a hot protective layer outside but in the core inside it is very calm and silent. Any karm kand (ritual) does not require muhurath (auspicious time). This is above tithi (lunar date). Sri Yantra can be placed on all four walls of your meditation room. Sri Yantra can be used in healing. Keep a photo between two yantras, tie it and send Shambhavi to it and results will be seen in 10-11 days. Sri Yantra reduces negative effects from electrical/electronic equipments. Do not expect anything from anyone, especially children. Pitru dosh can be due to many reasons like guilt, fear, hatred, unresolved issues, etc). Pitru ascension mean both mother and father's side ascension (yin-yang). Left side of the body is mother and right side is father. All who are attached to family go to pitrulok and they keep coming back as son in next life. All who are content will go to better loka (higher dimensions). Those with unresolved issues go to lower dimensions (preth loka). We remain rini (indebted) till 7 generations and we have to pay back. One who lives in pain goes in pain. While leaving the body, the emotions at that time will be multiplied by thousands of times. He suffers so much in the lower realms and a percentage of it passes to the 7 generations, in spite of the goodness the family does, but if one in the family becomes a sadhak and raises the father's consciousness the father's fathers and forefathers are released (7 generations). The moment they start vibrations, they leave the lower realms. The moment the ascension takes place, you will feel contended and a feeling of less burden on your shoulders. Do ascension only for those who are karmically connected (within the family) and NOT OTHERS. All spiritual guides who have helped you and guided you also ascend and they bless you and you get higher spiritual guides. When a man has too much of vasana and when death occurs he does not know about his death. Astral body is what travels out in dreams with the silver cord attached. When one is attached and the soul leaves the body, it gets confused and starts projecting all psychic impression and suffers without a body. If one is hungry, hunger is multiplied by thousands of times. If there is lust, then it is multiplied by thousands of times. Then whatever the soul sees, it gets into that body to fulfill that desire without being aware it is a human body or animal or any other. If rebirth takes place again and again and a person does not learn then karma yoni (human) is not given but bhog yoni (animal). In animal yoni if it gets into a goat, for example, and gets killed in a slaughter house, then only one karma is released, but with karm yoni in sadhana, nishkaam seva and sankirtan many lifetime karmas are released. Shradh (ritual for showing gratitude and reverence to ancestors) is not for their mukti (liberation). You can feed the poor without rituals, photos, etc. Pitrus get happy with this process and additionally it is a punya (good karma) for you. Don't give much attention to dreams (in sleep). When you give a donation never think money has lessened from you. After 84 lakh yonis one gets the last (bhog yoni) - cow. Whenever there is a natural calamity you should heal. With siddhis also come ahankar/lobh (ego and greed). With divorce, forgive them and the connection automatically gets cut off. When someone leaves and one on earth still remains attached, they remain in your body as pain, etc. All photos of dead people should be given jal or agni samadhi. (burnt or immersed in natural water resources). Self-realization is when there is no more desires. A siddha is omnipresent (present everywhere at the same time) and so there can be anywhere when a photo with diya is lit. But this should not be done for a non-realized person (dead family members) who is not omnipresent for you will end up pulling them back there. Dear Jaccob ji, you have done tremendous job for all Sadhaks by sharing such a great information. i specially thankful to you for this great work.